Business Essentials 4 Part Series. 4. Prospecting daily and aggressive lead follow-up. If you were to step into my office you would literally see it riddled with goals everywhere, in every corner. To start any adventure you need a goal, your big why? What’s important to you? If you were to jump into a boat and sail without a map you likely wouldn’t come back and would be lost out at sea. Too many people are lost at sea with no direction just stumbling through life. You need a clear course. Once you determine what that course is, it’s not good enough to simply keep it in your head. You have to write it down. Remember you get what you focus on the most. If you have clear defined goals written out in front of you, you will naturally attract the solutions to achieve them into your life and your subconscious mind just by looking at them you will naturally begin to work towards them. Remember everyone in life has different things that are important to them, different reasons that drive them. It could be family, health, and business, financial, spiritual whatever it is define it and get specific. If you are lost at determining what your big why is in life the best book I discovered and have used for 5 years and counting is a journal called “Living your best year ever” by Darren Hardy the publisher of Success Magazine. This journal will take you through the exercises of determining your goals and then setting up a system to achieve them daily by monitoring and tracking them. It is worth its weight in gold. I highly encourage anyone who wants to start working towards their dreams to get a copy, complete it. It will change your life. You can grab a copy right on Success’s website https://store.success.com/living-your-best-year-ever-by-darren-hardy.html for $49.95. No, I do not make a penny on promoting it, but it is the #1 book that keeps me on track and defining my big goals for the year. 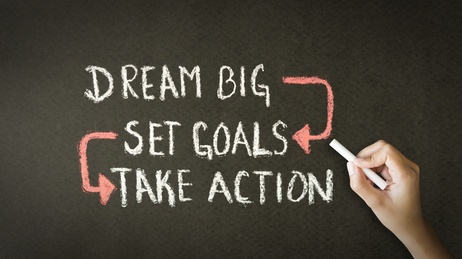 Make sure that when you are defining your goals you are picking goals that challenge you, move you and evoke emotion. If your goals are not big enough you will get complacent. I was always told that you want to pick goals that are so big that “if you told god your goals he would laugh.” Pick huge goals, something that will dramatically change your life once achieved trust me when I tell you even if you achieve 50% of what you set out to do you will be in a much better position than when you started. And you will certainly achieve more than 50% of what you set out. I want to reaffirm the importance of goal setting, I am telling you having been coached myself for many years and providing coaching to others the difference between winning and losing is having clearly defined goals that you take action on daily. IT ALL STARTS HERE FOLKS. · Write you goals out! Keep them in a place you will see every day. On the wall by your desk, in the bathroom, kitchen etc. Not in a drawer! · Use a vision board. Every year I place images of everything I want to achieve on a vision board big and small, with the date I want to achieve by and the cost. At the end of the year, I hit consistently over 90% of what’s on there because it’s in front of me every day. Now go out and set your goals, feel free to share them with us in the comment section below. Be the shining example of success you were meant to be!